SHIVA TRISHUL PENDANT-Beautifully shaped pendant , with the most elegant carvings on a Trishul and Damroo. Suitable to wear for both men and women. This pendant is made in pure 92.5 Sterling Silver which is the highest proportion of silver that can be used to make jewellery. If you would like to buy the silver chain, we would recommend that you check our silver chain category - Silver Chains or if you like a black cord, we have one available on our website - Black Cord Om Namah Shivaay !!!! Can be worn by both men and women. 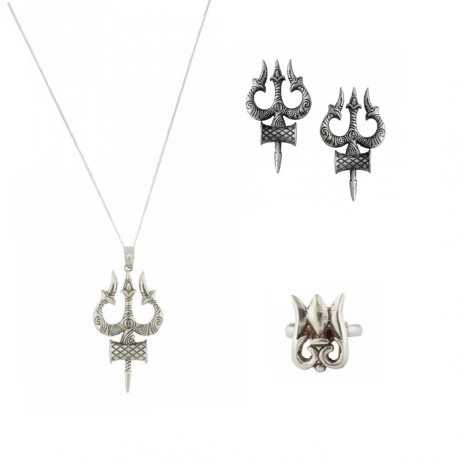 SHIVA TRISHUL STUDS-Beautifully shaped earrings , with the most elegant carvings on a Trishul and Damroo. Suitable to wear for women. This product is made in pure 92.5 Sterling Silver which is the highest proportion of silver that can be used to make jewellery TRISHUL RING-Designed around the Trishul motif , as carried by Lord Shiva , this ring has an adjustable shank , so it can fit any finger size. Suitable to wear for both men and women . Om Namah Shivaay !!!!! This Ring is made with pure 92.5 Sterling Silver which is the highest proportion of silver that can be used to make jewellery.